So last night a bunch of animation folks squeezed into Flaming Medusa Studios to talk about art business stuff for 2 hours. I shall attempt to recap what was said for those who couldn't make it. I expect after this is done it will be a pretty handy post for anyone who is starting freelancing. David Hartz (animator, fire sculptor, and professor of animation at UC Blue Ash) was also awesome enough to come and he was very helpful with providing his insight as well. And we begin. I have been hanging out with lawyers a little so let me also say that I am not a CPA or MBA or Lawyer so this is just based on my experience, but I'm no expert. I'm just telling you what I do. If you are working as a freelancer or independent contractor (same thing) on a project you must give the client an invoice in order to get paid. You don't get automatic paychecks if you're a freelancer like you would as an employee. I have had artists not send me invoices, even after I asked, which is weird because I don't understand the point of not wanting to get paid after doing work. So always send an invoice. This sample invoice is silly but it follows what an invoice should actually include: Information that you and the client need, it's designed simply so it won't waste ink when printed out. 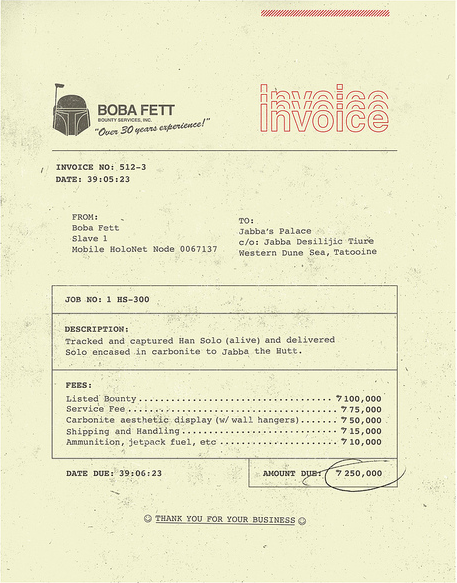 it also has an invoice number which is a number you can use for yourself (or not) to keep track of the invoice. This is helpful if you have a bunch of stuff going on at a time or multiple invoices out to a client, so you can refer to the number instead of being like "you know that one invoice I sent in-between the other 3? That's the one that's late". A common question was, should you itemize your invoice or just plonk the amount due on there? It depends on how you want to do it. You can do it either way, I plonk the number on there but David Hartz says he itemizes it. I would say if you're working hourly for someone you should itemize so they feel that you're being transparent and so they understand how your time was being used. You always need to keep a copy if the invoice for yourself so you can refer to it to see if a payment is overdue- you have the handy clients' info on it so you can call them if you need to without searching for the number. Invoices also help you keep track of how much money you've made throughout the year. The first payment you get from a client should always be a check, or maybe Paypal. Checks are preferred for a reason. Paypal is a written record of a payment and it has some protection built in for the client, but I still prefer checks when possible because they have protection built in for moi. A check is not only a handy way to get sent money, it also has valuable info on it. It has your client's name and address (2) the name of their bank (8) and their bank account number (9). This happens to be the same info you would need to take them to small claims court if they end up jilting you in the end! Hurrah checks! Make a photocopy of your clients' check before you deposit it so you have that info in case things go south. Client :"Oh I gave you x in cash remember I paid you already"
You: "No you only gave me half"
C: "No I paid you the whole thing I remember this many bills, remember?" You: "I wish I had made you pay me with a check because I don't like how this is going..."
Stay tuned for info about Proposals and how to not get your art stolen without getting paid!